At Asian Home Gourmet, we offer you a wide range of ingredient sauces, including soy and chilli sauces, fish sauce and coconut cream powder. With so many different types of sauces, it is easy to get confused with how to best use them. Take a look at the various ways these sauces can be used to enhance your dishes. Our Thai hot chilli sauce is ideal for any spice lover to use as a dipping sauce. This sauce can also be used to spice up your chicken and meat dishes, giving it that little extra kick. Make sure you're prepared for the added heat though - it isn't for the faint hearted! When cooking a lot of Asian dishes, our fish sauce will come in handy. This sauce is ideal for marinating, stir fries and is also commonly used as a dipping sauce in many Asian cuisines. The sauce is an amber-coloured liquid that is extracted from the fermentation of fish and is mixed with sea salt to produce a unique and delicious flavour. Coconut cream powder is the perfect addition to many curries, and is traditionally used in Asian recipes in replacement of the use of regular milk or cream. With a smooth, thick and rich consistency once water is added, coconut cream powder is perfect for thickening up dishes with less fat and calories, as well as making them milder for those who can't handle the heat. Be sure to check out our whole range of different sauces to make sure you're getting the most out of your Asian flavours and dishes. Soba noodles are common to Japanese and Korean cuisine. Traditionally made from buckwheat and sold dried, soba noodles have a nutty, earthy flavour. After cooking soba noodles in boiling water, run them under cold water to remove some of the starchiness. Light soups and cold salads are ideal dishes for this type of noodle. Rice Vermicelli noodles, made from rice starch, are long and thin noodles which can be bought either dried or fresh in Asian supermarkets. Simply soften them in a bowl of water before draining, and they are ready to serve. These noodles are perfect to cook with our Singaporean Laksa sauce for a rich and flavoursome meal with an abundance of fiery Chinese, Malay and Indian spices and a heady coconut aroma. Flat Rice noodles can be bought both fresh and dried in any Asian supermarket and are a staple in South East Asian cuisine. They have a slippery, chewy texture and are perfect in hot soups or a quick stir fry. Try this type of noodle in our Chicken Noodle Soup, and let the flavours of South East Asia warm you and your family up on a cosy weeknight at home. 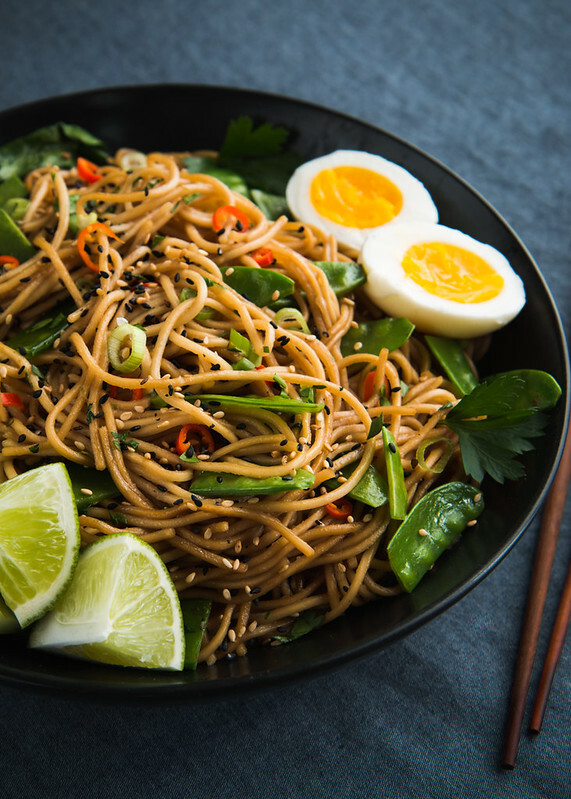 Egg noodles are one of the most common and versatile noodle varieties throughout Asia. Made with wheat or rice flour, eggs and water, these noodles can be purchased either dried or fresh. To cook, boil egg noodles in plenty of boiling salt water until tender, then drain, rinse in cold water and drain once more. A staple of Chinese cuisine, mix these noodles with our Cantonese Chow Mein paste together with your choice of vegetables, meat or seafood to create an unforgettable Asian experience in your kitchen.